It could be a great handball afternoon in Israel. Hapoel Ashdod from the 2nd place host the 100% leaders, Maccabi Rishon LeZion. The yellows led 23:26, 45 seconds to the end. The final result – 26:26 with amazing comeback by Oleg Butenko’s players. But, what happened afterward was an unbelievable shame for all the Israeli handball: from the federation, thru the teams and to each of every player. When the players came to shake hands there was a trash talk that progressed to a big brawl when Ashdod’s captain, Netanel Malul, gave a hit to Rastko Stojkovic and got a blue card. It is a shame for Ashdod’s captain, but we can’t forget how Stojkovic acted in the Rishon LeZion grand derby (we published it on Handball Planet Instagram). And even that moments wasn’t the end. When Maccabi’s captain, Yoav Ne’eman, gave an interview to the israeli channel 5, there was another brawl near the locker room. Until this moments, Ashdod was the only responsible who published a sorry post. The federation and Maccabi didn’t publish anything. More Over, If you look on the israeli handball federation YouTube, The video end is excatly before the first brawl (You all can compare to what we publish here). In handball matches that finished with sports way:Maccabi’s city rival, Hapoel, continue to look bad. They met Maccabi Kiryat Motzkin from the 8th place. Tihomir Doder played in the most of the match with 7 players and his team was equal to the reds, but Novak Boskovic scored the late winner goal – 23:22 for Hapoel. Omri Maimon went with his H.C Ness Ziona to his ex-team, H.C Holon. Ness Ziona had a tough match without the club’s injured best player, Nivo Levy, and Holon took a 19:23 lead in the beginning of the second half. Maimon’s players with the goalkeeper, Oren Meirovich, showed the team’s character again and won 31:30. In the relegation zone match, Hapoel Ramat Gan met Hapoel Kiryat Ono. After 11 consecutive loses, Ramat Gan from the last place signed the bosnian back player, Aid Selimovic – Kityat Ono’s and HC “Bosna” Visoko’s ex. It was very helpful because they won 29:23 and cuted the gap between the teams to one point only. In the Sharon’s area derby, SGS Ramat Hasharon continued to show a great attacking abilities and beat Bnei Herzliya 40:37. On Thurday evening, H.C Beer Sheba became a playoffs candidate with 23:22 on Ironi Rehovot. 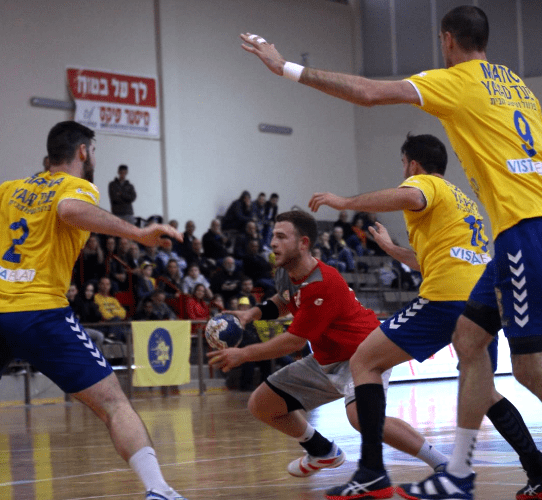 On Tuesday – The israeli handball cup semifinals: 18:00 – Hapoel Ashdod – H.C Holon, 20:15 – H.C Ness Ziona – Maccabi Rishon LeZion.